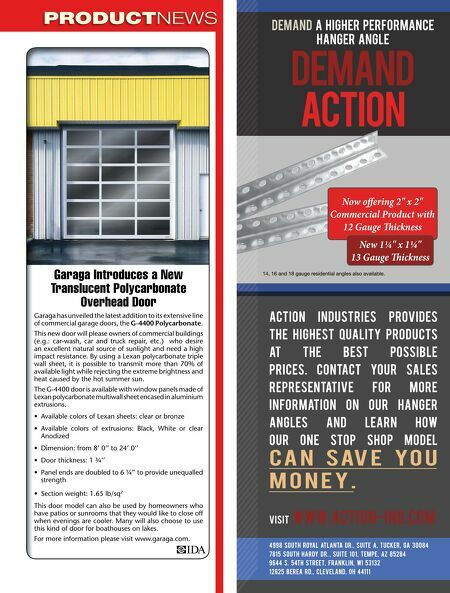 PRODUCTNEWS DeMAND A HIGHER PERFORMANCE HANGER ANGLE DEMAND ACTION Now offering 2" x 2" Commercial Product with 12 Gauge Tickness New 1 ¼" x 1 ¼" 13 Gauge Tickness Garaga Introduces a New Translucent Polycarbonate Overhead Door Garaga has unveiled the latest addition to its extensive line of commercial garage doors, the G-4400 Polycarbonate. This new door will please owners of commercial buildings (e.g. : car-wash, car and truck repair, etc.) who desire an excellent natural source of sunlight and need a high impact resistance. By using a Lexan polycarbonate triple wall sheet, it is possible to transmit more than 70% of available light while rejecting the extreme brightness and heat caused by the hot summer sun. The G-4400 door is available with window panels made of Lexan polycarbonate multiwall sheet encased in aluminium extrusions. • Available colors of Lexan sheets: clear or bronze • Available colors of extrusions: Black, White or clear Anodized • Dimension: from 8' 0'' to 24' 0'' • Door thickness: 1 ¾'' • Panel ends are doubled to 6 ¼" to provide unequalled strength • Section weight: 1.65 lb/sq2 This door model can also be used by homeowners who have patios or sunrooms that they would like to close off when evenings are cooler. Many will also choose to use this kind of door for boathouses on lakes. 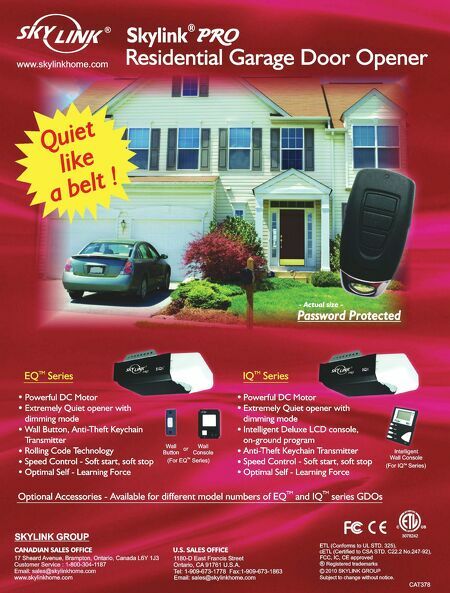 For more information please visit www.garaga.com. Visit www.action-ind.com 4998 South Royal Atlanta Dr., SUITE A, Tucker, GA 30084 7815 South Hardy Dr. , SUITE 101, Tempe, AZ 85284 9644 S. 54th street, Franklin, WI 53132 12625 BEREA RD., CLEVELAND, OH 44111 Action Industries provides the highest quality products at the best possible prices. Contact your sales representative for more information on our hanger angles our and one stop learn shop how model can save you money. 14, 16 and 18 gauge residential angles also available.